I love Chainmaille jewelry... and my favorite to make are chunky pearl and gemstone beaded ones. Anodized Aluminum rings in a dark warm coppery brown woven in the Tryzintine pattern, which is an off shoot of the Byzantine one of the most popular and beautiful chain designs. 8mm Unakite beads blend with baroque copper colored and golden hued freshwater pearls. All the pearls were re drilled by hand to use on 20 ga copper wire. A handmade copper hook clasp creates a bracelet that is Fall inspired. 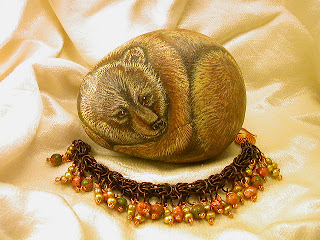 The bear, I painted on river rock in acrylic paint.